Read Robert Furman Newspaper Article. Robert Furman (1915 - 2008) was a civil engineer and Chief of Foreign intelligence during the Manhattan Project. 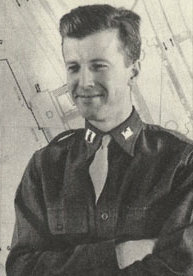 Furman, who served as General Leslie Groves’ assistant during the building of the Pentagon and the Manhattan Project, coordinated and was a part of the famed Alsos Mission, conducting espionage missions across Europe to interrogate Italian and German scientists, locate uranium, and determine how far the Nazis had proceeded with their atomic bomb project. Furman’s first trip overseas as part of the Alsos Mission came in June 1944, when he travelled to Rome to interrogate Italian scientists about the possibilities of a German nuclear program. As the war progressed, Furman and the Alsos team moved into occupied France, conducting several missions to locate and remove uranium oxide that had been stored in warehouses near enemy lines. He also helped coordinate missions to kidnap and interrogate German scientists toward the end of the war to find out the extent of the Nazis’ nuclear program. For more information, please see Robert Furman and the Alsos Mission. In late July 1945, Groves assigned Furman the special task of personally escorting half of the uranium necessary for the atomic bomb “Little Boy” to Tinian in the Mariana Islands aboard the USS Indianapolis. After the war, Furman was sent on a special mission to Japan to investigate whether any efforts had been made by the Japanese to develop a nuclear weapon. Shortly thereafter, Furman returned home and began his own construction business, where he would work for the next fifty years. 1915 Aug 21st Born in Trenton, New Jersey. 1937 Received a B.S. in Civil Engineering from Princeton University. 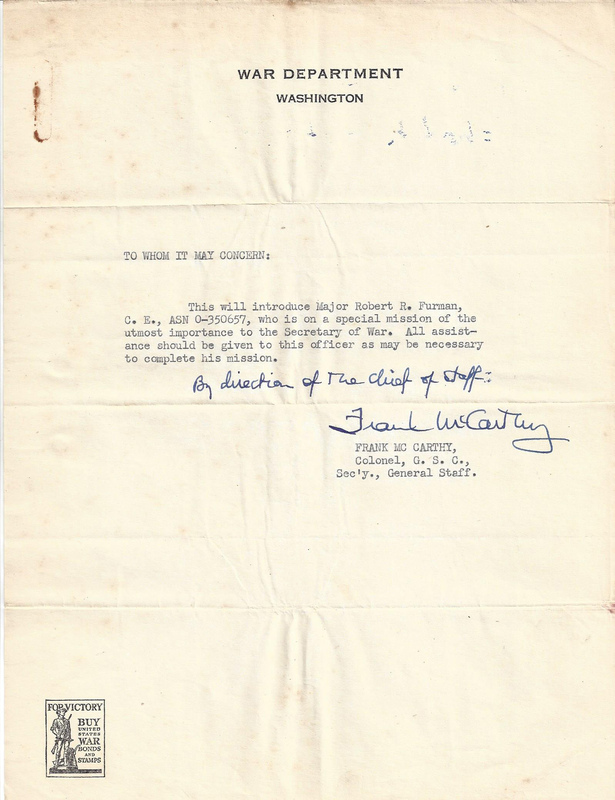 1940 Dec Activated as a member of the United States Army Reserve and assigned to the Quartermaster Corps Construction Division, where he worked for Colonel Leslie R. Groves, Jr., supervising the day-to-day construction of The Pentagon.